SendStation PocketDock AV – iPod Break Out Box In Your Pocket | OhGizmo! While I’m not crazy about the physical size of the video-capable iPods (I prefer the Nano) I do like the fact they have a video-out option. It definitely makes up for the small screen and with the right software can serve as a portable, pocket-sized Tivo. And while the ridiculously overpriced ‘official’ Apple AV cable works well enough using the iPod’s headphone jack there are higher quality solutions. SendStation’s PocketDock AV for example attaches to the iPod’s dock connector instead and provides an s-video connection which should give a better picture than the standard composite hookup. Besides the obvious fact that the PocketDock AV is far smaller than any of the other docks on the market it can also be used while your iPod is in a case thanks to a built-in extender for the dock connection. 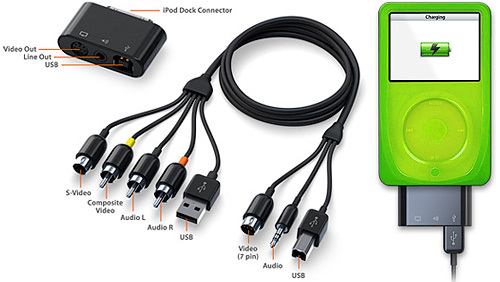 And as an added bonus the cable used with the PocketDock AV can also be connected directly to a 15″ or 17″ PowerBook for outputting the screen content to a TV. The PocketDock AV will be available from SendStation in the near future for about $37. That is brilliant! If I had a video iPod, this would be a must-have.